I basically just followed the recipe for my Banana & Cranberry Breakfast Muffins and replaced the cranberries with pecans. 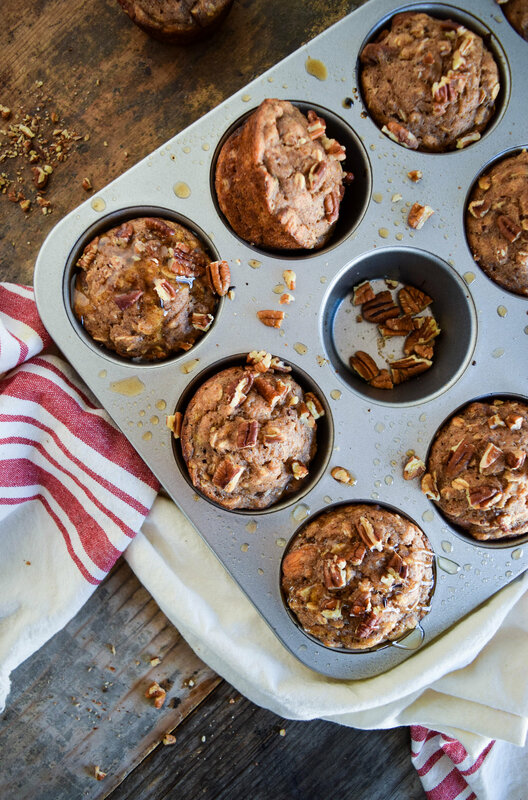 It was a small change but the pecans really changed the flavor of the muffins! 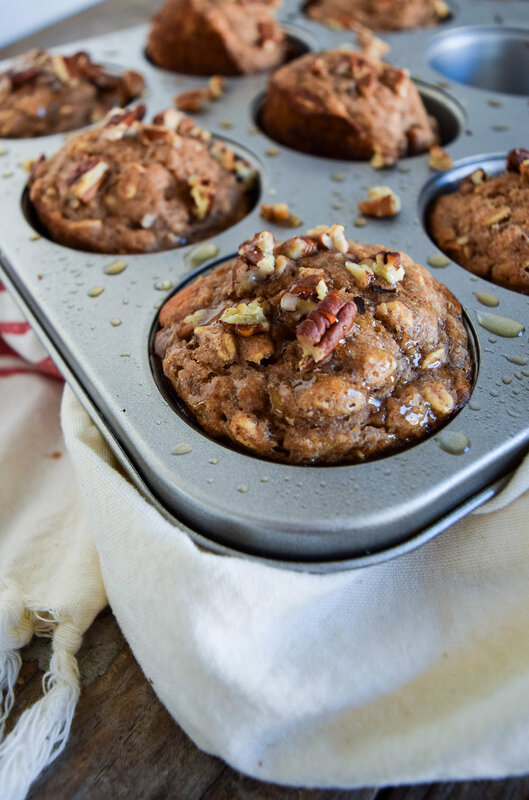 These banana pecan muffins are so perfect for this season and represent everything dreamy and cozy about fall. Just wait until you make them... your kitchen is going to smell amazing!! I highly recommend eating these right out of the oven. They are warm and moist and nothing will ever top them in that form. With that being said, you can eat them room temperature on the run or re-heated whenever you'd like. * Flax see eggs are egg replacements made from flax seed and water. For each "egg" you will need 1 tablespoon ground flax seed and 3 tablespoons water. This recipe calls for two eggs, so you will be mixing 2 tablespoons ground flax seed with 6 tablespoons water. Do this before you even being the process of making the muffins as the mixture must sit for 15 minutes. Stir the mixture well and place it in the fridge for 15 minutes. The mixture should have a thick, egg-like consistency before you mix it into the muffin mix! 1. Preheat oven to 400 degrees F. Oil a muffin pan and set aside. 2. In a large bowl, mix together flour, rolled oats, brown sugar, baking powder, cinnamon and salt. 3. In a separate bowl, mash the bananas very well. Mix in coconut oil, flax eggs, almond milk, and vanilla extract. 4. Make a well in the bowl of dry ingredients. Pour the wet ingredients into the well. Use your hands to gently mix the ingredients. Don't over-do this, you want all the ingredients to be mixed and wet, but you still want chunks. A good way to do this is to gently mix until all of the air bubbles are gone. 5. 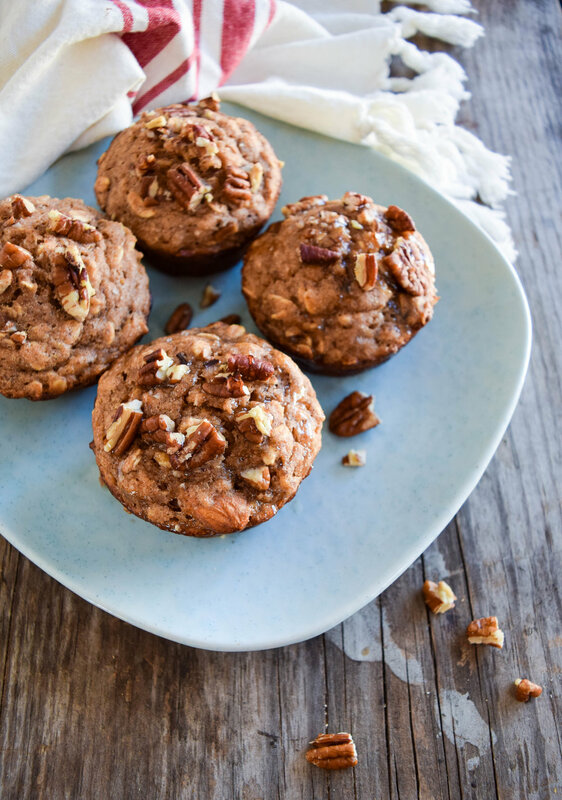 Fold pecans into the muffin mix. 6. Evenly distribute the mixture into you muffin pan. Bake for 16-18 minutes until golden. Let sit for at least 5 minutes before serving.